In every large organization, one always faces the issue of complexity. Responsiveness and focus can suffer when there are too many layers, yet having enough control is always necessary. As Emerson ad Honeywell have also done in recent years, ABB is addressing this by restructuring and pushing down responsibilities into their regions and business lines. The challenge is in giving product and solution lines sufficient visibility and sales time that they can reach customers. Being a huge organization with so many products and solutions, we see some challenges in certain product lines that do not have their own dedicated sales focus in being as successful as they could be. In regard to ABB’s Ability brand and theme, everything now seems to be ‘Ability-ized’ whether it has changed and been digitized or not … there is some risk in confusing customers about what Ability is and is not, despite ABB’s internal requirements for what qualifies as an Ability product or solution. But clearly a number of products are now built-on or have been re-purposed on the new platform with renewed functionality, with many more to come. Third, partnerships with Microsoft and HPE are more then skin-deep. Microsoft plays a key role in the Ability PaaS in while HPE provides Edge computing and data center solutions embedded with ABB content. We are interested to see just how far HPE and ABB can go together as IT and OT move forward together. Since ABB outsources the manufacture of their I/O and controllers, both ABB and customers could benefit from potentially lower cost and more functionality if HPE were to step in and manufacture new O-PAS compliant hardware leveraging their global manufacturing capabilities. Fourth, we were most interested to see where ABB is headed in the APM and Digital Twins space. So, my first stop was in the power generation and grid space where ABB has traditional strengths. 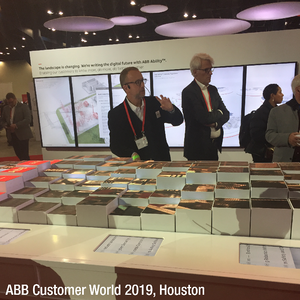 We were pleased to see how ABB has assembled Digital Twins for grid components, distribution and network optimization along with workforce management with their Ability Ellipse APM solutions. While they can also handle power generation, they did not emphasize it as much as the low and medium voltage distribution end, so they have some work to do to keep up with competitors who are strong in the power generation space. From power gen and electrical I moved on to industrial control where ABB has a major share of the process control market. There they have a highly functional systems that can handle most continuous and batch industrial processes, be they in power, mining and process, but they face a couple of challenges. First, with 4 different control systems and 12 versions in service, how do they migrate forward to a simpler, more open world? The control system profit driver has traditionally relied upon on the hardware lock-in due to high switching costs plus costly services to drive profitability. But at some point, the chickens come home to roost and it becomes untenable and unprofitable to maintain so many systems and versions, when in fact they all largely do the same thing. Toward this ABB appears receptive to the Open Process Automation initiative (O-PAS), though not necessarily on the same timeline as some end users might wish. Still they have to do something so it will be interesting to see where they ultimately go. End-users need to appreciate the dilemma that automation suppliers face in transitioning from a high gross margin but low net margin business, and work toward a win-win where each side realizes that the value is not in the hardware anymore but in what runs on it and around it. And what runs on and around should have a both a high gross margin and a higher net margin. 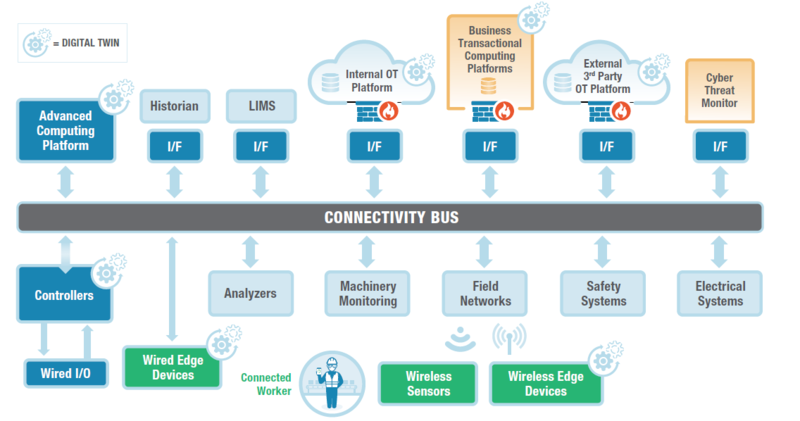 This requires a change in the way end users buy process control systems and a realization that they are not just buying a DCS, but with IIoT, Edge computing, the Cloud, Digital Twins and the Connected Worker, are buying an “OT Ecosystem”, which includes a lot of IT components and services. ABB is one automation company that gets this. Finally, we were most interested to see what ABB was doing in Digital Twins for the process industry and this is where they face some gaps and challenges. ABB has a highly functional Twin for electrical distribution at the plant level which can be combined with an Energy Optimization solution. They also have an Operator Training System (OTS) that runs separately from the control system hardware and can utilize any third-party simulator or the client’s choice. This approach has worked fine for OTS but is a gap in that ABB lacks their own process simulator for design and engineering as well as process Digital Twins, not to mention integration with supply chain applications. This leaves them behind competitors who offer asset and process Twins, both of which will be front and center to process customers. At the asset level, they do have some Elipsys library components that carry over from power generation and mining, but not a complete library of asset components for process plants. Given recent partnerships of Emerson and AspenTech, Honeywell with its own Unisim and Asset Sentinel, KBC with their own PetroSim and BakerHughes, AVEVA with its own SimCentral and PRiSM, and Siemens tying up with PSE and Bentley, the market for potential partners or acquisitions is shrinking. It is always better to be in the driver’s seat than a passenger when it comes to Twins as the potential in the process industries is so large. Nevertheless, with ABB’s considerable size, know-how and financial strength, we see no obstacles that they cannot overcome. We look forward to seeing how this major industrial player strives to become the digital transformation company to which they aspire.